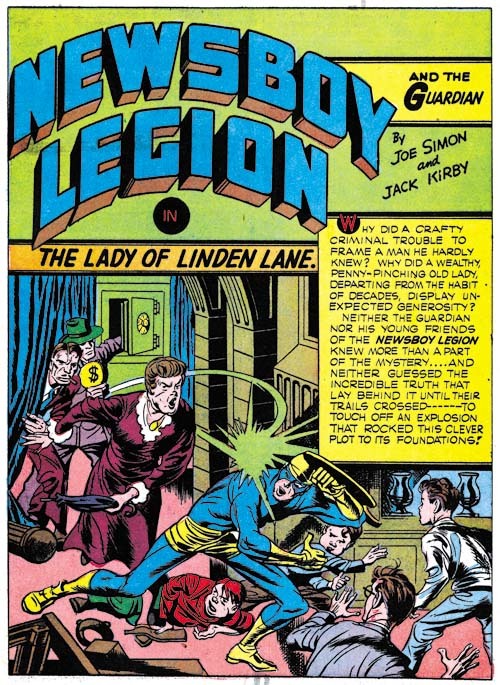 During a recent visit to Joe Simon I picked up a copy of DC’s “The Newsboy Legion by Joe Simon and Jack Kirby” volume 1. This post will not be an unbiased review as I was one of the contributors having provided all the covers. I have been extremely busy with restorations for “Simon and Kirby Superheroes” but I had previously scanned and cleaned up these Star Spangled covers so providing them to DC did impact my commitment with Titan. The covers are generally not what I would call full restorations but I think they came out rather well. 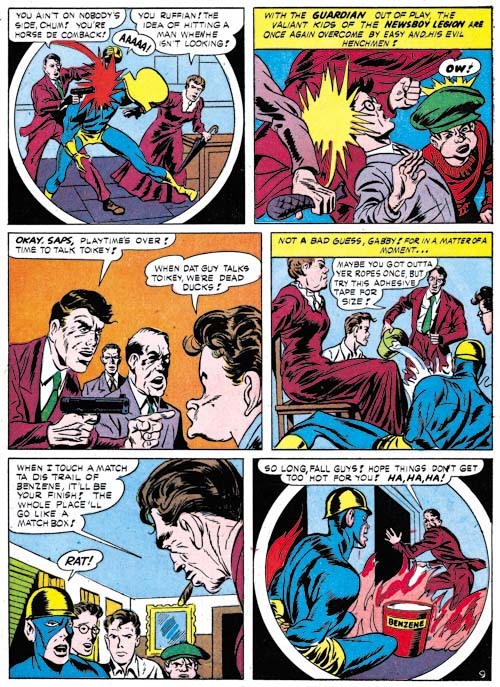 The restoration of the stories was done by others (Rick Keene and Mike Montagna) and is even better than the work done for “Simon and Kirby’s Sandman”. I know there are some who are critical of DC’s approach but I am not one of them. I am pleased to see that only Marvel continues to follow the outdated technique of art “reconstruction” (a code word for recreation). 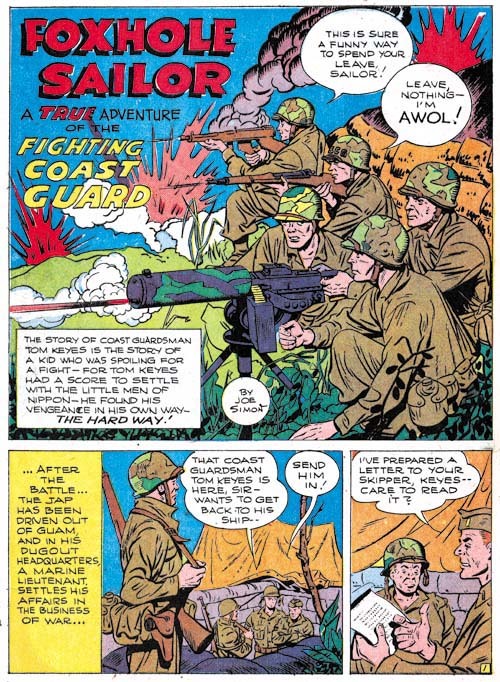 This first volume covers the work that appeared in Star Spangled issues #7 to #32 (April 1942 to May 1944). Joe and Jack provided DC with a handsome inventory before they went into military service. Because of that inventory this volume is almost exclusively work by Simon and Kirby with only three stories and a single cover drawn by other artists. There are some aspects about this archive that I am less satisfied with. Mainly the smaller dimensions of the book requires that the art must be slightly reduced in size with narrow the gutters and margins. This was true for the Sandman archive as well. But I suspect this was all done to keep the cost of the book low. 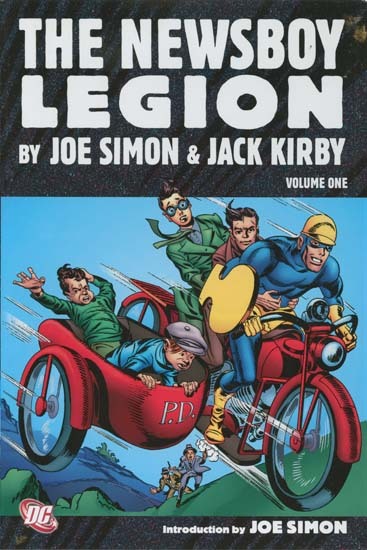 The dust jacket shows re-colored Simon and Kirby art. I am not a fan of the use of modern coloring on gold and silver age comic art. The line art was made for the type coloring and printing that it originally received. I have not seen any examples of the successful use of modern coloring applied to older art. But hey it is just the dust jacket and it is the contents of the book that really count. A particular appeal feature of this reprint is the introduction written by Joe Simon. It seems so obvious a choice that I do not know why Joe is not asked to do more of these. Joe is a great writer and this is another of his fascinating essays. I will not discuss the contents at this time so the reader will just have to buy the book. But it does cover a wide range of the history that lies behind the Newsboy Legion. Simon and Kirby’s Captain America was so innovative that it changed the comic book industry. However it was at DC that the Simon and Kirby collaboration really jelled. Which is why I am so pleased that DC will be reprinting so much of this important material. There should be a volume two for the Newsboy Legion and DC has announced the first Boy Command volume as coming out in November. Simon and Kirby fans live in exciting times. I do not understand apologists for Vince Colletta. This is not a rant against Colletta and his inking. I recently reread Kirby’s Fourth World series and I actually liked Colletta’a inking on those comics. There Vince showed a mastery of the use of a brush that was very admirable; not overly tight but still controlled. But the facts remain that Colletta did erase some of the pencils by Kirby and other artists. It should not be at all surprising that many fans of those artists object to Vince’s deletions. The recent issue of the Jack Kirby Collector (#54) has an article by Colletta apologist Bruce Hannum (“Vince Colletta Not Always the Culprit”. It is an interesting article that shows the original version of two covers drawn by Kirby and the changes directed by Stan Lee for the published comics. For one cover this amounted to the removal of a minor item while the other cover was altered significantly by the elimination of a lot of back ground features. The topic of the changes made to an artist’s creation in preparation for publication is a fascinating one and the article would have been very pleasing had it been left at that. 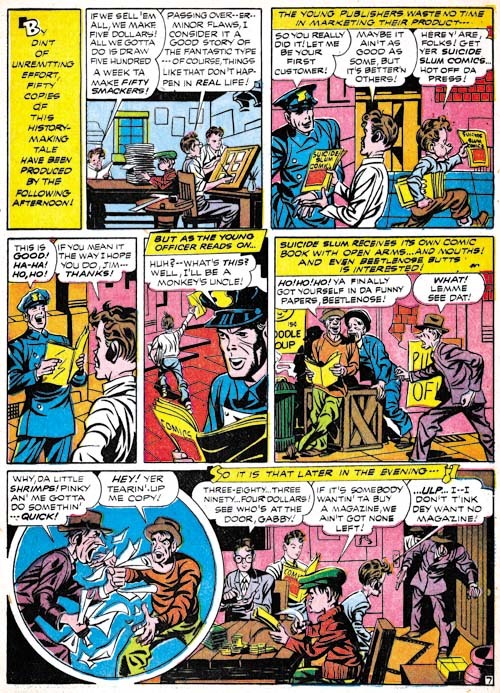 However Hannum proceeded to try to attempt to associate the Lee directed changes to Kirby’s art with the erasures by Colletta, even suggesting that Colletta was taking Lee’s actions as a guide to his inking of Kirby. In short Hannum is trying to justify Colletta’s use of an erasure by Lee’s editorial changes. I have two big problems with the Colletta to Lee comparison. The first is the motivation. There is little doubt as to Lee’s motivation; he felt it the alterations would help with sales. You do not have to agree with Lee’s decisions to recognize that was why he made them. Frankly I often wished Stan would leave Kirby’s art alone (Genesis of a Cover, Captain America #105). But I am a fan with an interest in the art while Lee was an editor interested in sales. 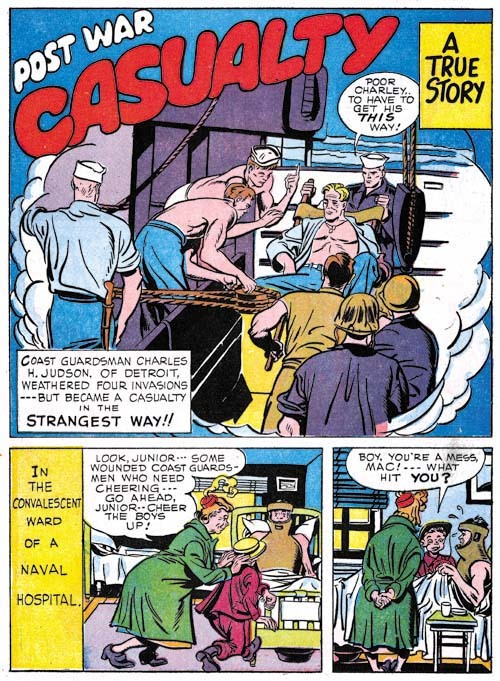 Joe Simon made similarly motivated decisions about Jack’s covers although he usually redid rather than reworked the cover (Alternate Versions of the Alarming Tales #3 Cover). And while the two examples in this article show the elimination of art not all of Lee’s directed modifications of Kirby covers were just elimination. One thing that Stan’s actions certainly were not and that was they were not attempts to save time. However Colletta’s erasures do look like a time saving measure. None of the examples I have see look remotely like aesthetical decisions. Since the erasures were in unobtrusive parts of the story art they were not likely to affect sales either. Further unlike Stan, I have seen nothing to indicate Vince ever significantly added to or altered Kirby art. No, the Colletta apologists have made an unconvincing case that Colletta was trying to improve Kirby’s art. But for argument’s sake let us accept the proposition that Colletta’s goal was improved art. This brings me to the second big problem with the Colletta to Lee comparison; they don’t compare. Simply put, Stan Lee was the editor. His responsibility went beyond just assigning work to artists; it went to the entire finished comic. If a comic was a disaster, in eyes of Goodman (his boss) it would be Stan’s fault not the artists. Kirby and the other comic book artists might not agree with Lee’s decisions but I doubt any questioned that those decisions were Stan’s to make. But the same would not be true for Colletta as an inker. It is only from Colletta apologists that I have heard the suggestion that the final art was the more responsibility of the inker than the artist who drew it. I suspect that most pencilers and their fans would not agree. But why is such effort expended in defending Colletta? Do the apologists really feel that inkers are more important than pencilers? Or do they actually believe that Colletta is a better artist than Kirby? And if they do think Colletta is such a great artist what is that opinion based on? I have heard that Colletta drew really nice romance comic art. 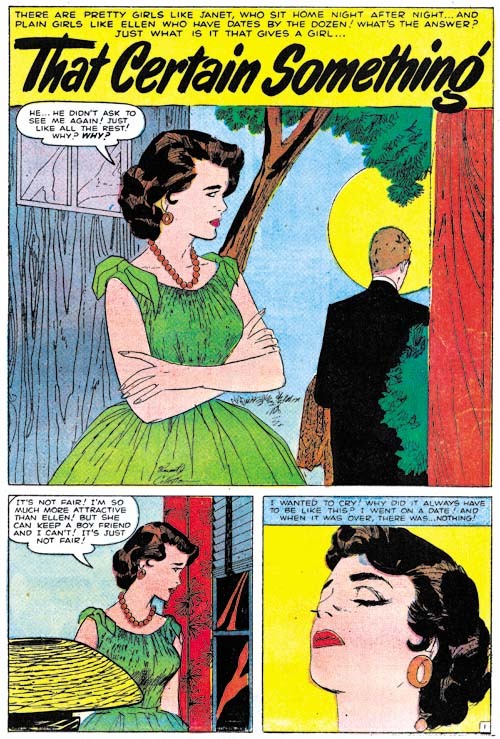 However none of the Colletta apologists seem that interested in romance comics and romance fans seem to prefer other artists over Colletta. And can the apologists really feel Kirby was wrong to stop using Colletta’s inking services? After all Jack was the editor for his Fourth World comics, why shouldn’t that have been his prerogative? Like I said, I just do not understand Vince Colletta’s apologists. Who cares about Simon and Kirby? Well judging by the first two years of this blog’s existence only a small number of fans. But it was not just the low number of visits to my blog that suggested that Simon and Kirby were pretty much forgotten by the larger public. 2006 and 2007 also did not really have much in the way of books with significant Simon and Kirby content on the market. But all that has changed. In the last two years the number of visits to the Simon and Kirby Blog has increased by a factor of ten and it keeps on rising. The last year saw the publication of Titan’s “Best of Simon and Kirby” and DC’s “Simon and Kirby Sandman”. 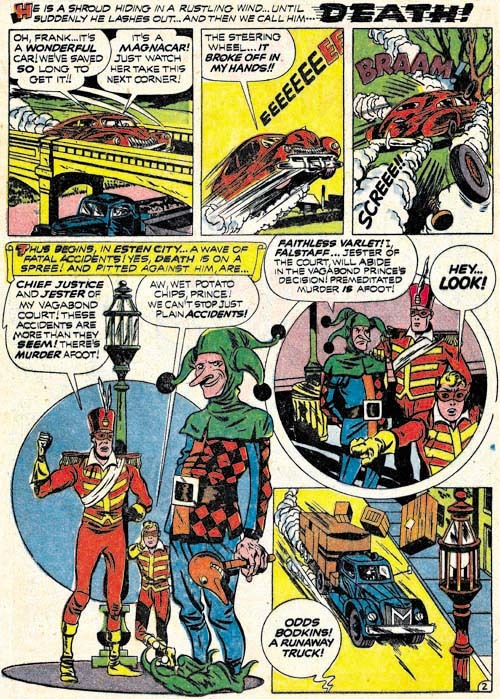 This year should see DC release books on the Newsboy Legion and the Boy Commandos. Even more important Titan will be publishing the “Simon and Kirby Superheroes” (okay I’m biased). I still believe what I wrote in my last anniversary post, that the key event to this change in interest was due to the publication of Mark Evanier’s “Kirby: King of Comics”. I did not envision any of this when I wrote my first post on March 17, 2006. I just wanted to spend some time writing about my favorite comic book collaborators and the artists who worked for them. I had been studying Simon and Kirby for quite some time before starting this blog but something changed once I did. I found that writing helped clarified my thoughts. That and the studies that accompanied my posts greatly increased my knowledge. I have learned much more about Simon and Kirby in the last four years then I have all the time before that. I admit that keeping the blog going during the last year has been quite difficult. My restoration work for “Simon and Kirby Superheroes” has taken up much of my time (I will be posting about that in the not too distant future). But I love writing this blog and do not want to give it up even for a short while. And there is so much more to write about. My serial post Art of Romance has gone 28 chapters so far but is only up to the end of 1954 while I intend to take it up to 1960. Another serial post, Little Shop of Horrors, has gone 9 chapters but alas will end with the next one. And yes I know there are other serial posts that have long been idle (It’s a Crime and Wide Angle Scream) however I fully intend to write more on them at some point. In the past I posted about two titles (Foxhole and In Love) from Simon and Kirby’s short attempt at being publishers but I have yet to give Bullseye and Police Trap a similar treatment. DC is reprinting their Simon and Kirby material and that provides an added incentive to writing about Sandman, the Newsboy Legion and the Boy Commandos. With so much to discuss about Simon and Kirby I am sure this blog will have many more anniversaries to come! Some time ago I posted about the practice of reconstructing art that Marvel was using in their Masterworks reprint volumes (Recreation Vs. Restoration, How Should Reprints Be Done?). I was, and still am, rather critical of that approach. My criticism is not just theoretical, some of the reconstructions made in the past have been very poor indeed (The Human Torch #2). I concluded my Recreation Vs. Restoration post with the observation that the use of reconstructed art makes Marvel reprints of little use for me and that I would no longer be buying them. But of course, one should never say never. I have long been on the look-out for a copy of Daring Mystery #5 (June 1940). 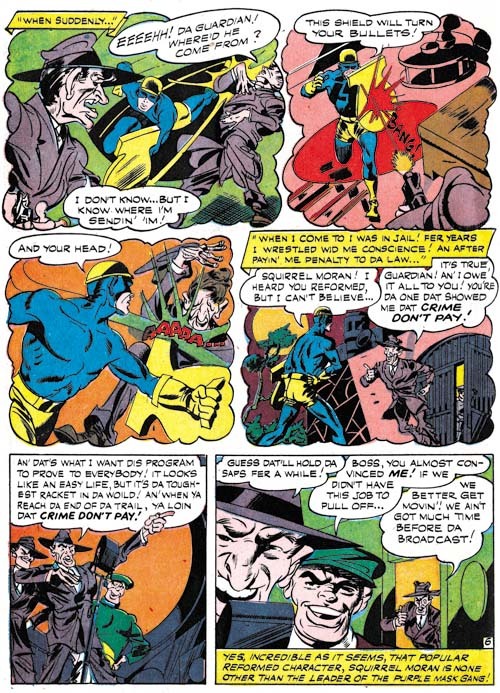 Some have claimed that the Trojak story contained in the issue was drawn by Joe Simon. 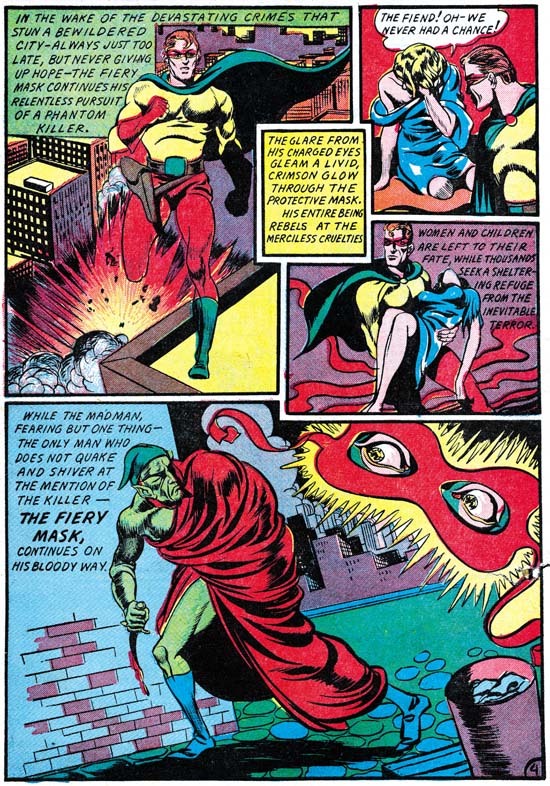 This was altogether possible because I believe Joe did do the Trojak in Daring Mystery #4 (May 1940) and he certainly drew the Fiery Mask story in Daring Mystery #6 (September 1940). Even if Simon had not drawn Trojak story in DM #5 I still thought it would be nice to see the story of this Simon created character. However Daring Mystery comics are rare in any shape and I have searched for many years in vain for an affordable copy of issue #5. So when I saw the recently released Marvel Masterwork’s Daring Mystery Volume 2 I decided that even reconstructed art was good enough for my purposes and bought a copy. Although I had not bought a Masterwork volume for some time I did have an occasion to see the quality of the reconstruction was done in a Marvel Mystery Comics reprint volume. When the Best of Simon and Kirby book came out I received some criticism on the Marvel Masterwork forum for the restoration that I did on the volume. At one point someone posted a scan of the splash page of the Vision story from a Masterwork book. A comparison of the scan with one from the same splash from BoSK showed some rather poor reconstruction in certain areas in the Masterwork version. Now that I had the Daring Mystery volume I was curious on how well the reconstruction was done. Of course I did not have a copy of DM #5 but I did have copies of the other issues. At a glance the reconstruction of the story art (by Pacific Rim Graphics) looked pretty good. But I decided to take one example (the demon figure from the Fiery Mask page shown above) and overlay scans from the original comic and the reprint. I digitally bleached both scans so that for the most part only the line art remained. I changed the line art of the original comic to red and that from the Masterwork to cyan (blue). If both were identical the resulting lines would look black but deviations would show up in one of the two colors. Experience has shown that you never get perfect overlays. Even scans from the same comic will vary from day to day. Paper “breaths”, it expands or contracts with humidity changes. To illustrate what I found I have shown a close-up of the Demon’s foot. I have marked the most glaring difference as item 1. However the error in this case is due to the digital bleaching I did. The robe was red while the background was green. The registration was not perfect and the cyan (blue) of the background printed over a portion of red. The red (magenta and yellow) and cyan inks combined to form black. Chemical bleaching would have removed the erroneous black but digital bleaching does not. But the black due to the registration error and the black ink of the line art are not identical. If I were doing the restoration I would edit the result based on that difference and as far as I can tell the Masterwork’s reconstruction is accurate. My registration is not perfect and as I described above variations due to paper expansion or contraction are also expected. Therefore I would not judge most of the failures to overlay correctly to be of any significance. The one I marked as 5 shows that the original comic was slightly to our right. However the line on the opposite side of the foot is also slightly to the right. I expect both “errors” are due to the problems I described above and are not reconstruction errors. There are also other variations in line width that could be explained by variations in the printing. However it is also possible that they are reconstruction errors but I cannot tell without seeing the actual comic used in the Masterwork reconstruction. Now look closely at the heel (marked as 2). 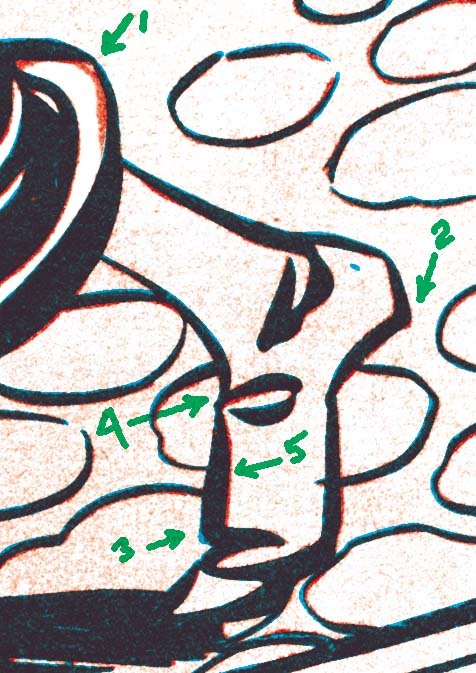 The bottom of the heel in the original comic was not smooth but deviated slightly near the end. This cannot be explained by the factors discussed above and is I believe an error in the reconstruction. On the opposite side of the foot (marked 3) is a case were the reconstruction has added an angle that was not present in the original. The fold spotting pointed to by item 4 also deviates in ways that seem to reconstruction errors. One might think that I am criticizing Pacific Rim Graphics for the reconstruction job they did. Actually far from it, I believe they did an excellent job. These are really small errors that can only be seen when magnified and would be difficult to spot with the naked eye. The covers were reconstructed by another (Michael Kelleher). This is same reconstructor that I mentioned in my earlier post who admitted to using a primitive reconstruction method (inking on tracing paper) and was completely clueless why some would find this objectionable. I did not do an overlay of his work but careful examination suggests it was accurate. The only thing I noticed was that his lines were consistently narrower than those from the original comics. Perhaps the original comics he used had been better printed or perhaps this was done on purpose. I did not have time to make detailed comparisons of all the work from Daring Mystery issues 6 to 8 with the Masterwork volume but overall they looked good. I feel this volume does justice to the original artists. Does that mean I approve of the use of reconstructed art? Not at all, I still prefer scans. No matter how well done, a reconstruction is still one artist’s interpretation of another artist’s work. But let us be frank, the reader will unlikely to find a single coverless issue of Daring Mystery for the price of the Masterwork volume. One little warning about the Masterwork book, the cover for Daring Mystery #7 was not drawn by Joe Simon. I have no idea how such an obvious mistake was made.